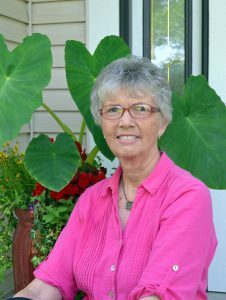 Carol Van Klompenburg, author and retired Write Place owner, started her first flower garden 25 years ago. 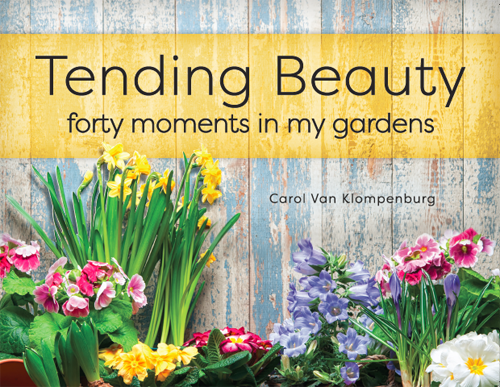 Van Klompenburg has channeled this love into a flourishing garden with multiple beds of annuals and perennials—and a new essay collection titled Tending Beauty: Forty Moments in My Gardens, which was published by the Write Place earlier this month. Although written over the course of a decade, the essays in Tending Beauty are arranged as if they take place in a single year. In a luminous mix of prose, poetry, and photography, Van Klompenburg invites readers to walk with her through her garden’s life cycle. She guides tender sprouts toward the light, makes war on weeds, chases chipmunks, marvels at butterflies, and relishes the beauty of her flowers. Carol Van Klompenburg lives with her husband, Marlo, near Pella. Her previous books include On Mended Wings, In Search of a Better Way, and Delightfully Dutch. Tending Beauty is her first book on gardening, though she sometimes writes about her gardens on her blog, carolvanklompenburg.wordpress.com. Tending Beauty will first be available at Van Klompenburg’s gardens during the Gateway to Hope Garden Tour, June 29 through July 1. Van Klompenburg will donate royalties from the Garden Tour sales to Friends of Chinandega, the charitable cause of the tour. Tour hours are 3:00 p.m. to 8:00 p.m. on Friday, 10:00 a.m. to 4:00 p.m. on Saturday, and 1:00 p.m. to 4:00 p.m. on Sunday. More information about the Garden Tour, including a list of locations and a tour map, can be found at www.friendsofchinandega.wordpress.com. After July 1, Tending Beauty will continue to be available from Van Klompenburg (carolvk13@gmail.com) and from Thistles Flower Market of Pella. It can also be ordered from Amazon or BarnesandNoble.com.